Next Diwali delicacy which was made at home was Shakarpara- One of the famous crispy sweet Gujarati snack which can be munched on and on. Start by making dough. Take maida in a large wide bowl. Use the milk which has been boiled already. If it is not warm, heat it a little. Add powdered sugar to it. Stir it till sugar dissolves in milk. 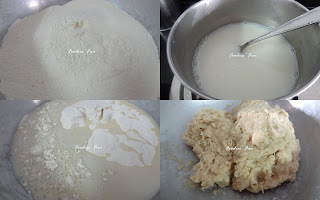 Add this sweetened milk and ghee to maida. Knead the dough properly till you get elastic like pliable dough. Make big balls out of the dough. Roll the dough to a big chapatti (sheet) with the help rolling pin. Make sure you don’t make it too thin. It should be slight thick. Now using the patterned spoon make diagonal cuts on the sheet giving it a shape of diamond/square. Heat oil in kadai to fry shakarpara. Put this squared dough shakarpara in kadai to fry on medium flame. Fry till both the sides turn golden brown. Transfer it on an absorbent paper and let it cool. Serve this crispy sweet snack. It has to be stored in air tight container and can be stocked up for two weeks.